Israeli forces late Monday surrounded the homes of two men suspected of kidnapping and killing three Israeli teens, and prepared to demolish the houses, locals said. Witnesses told Ma'an Israeli soldiers had forced the residents out of the houses of Ammar Abu Eisha and Marwan al-Qawasmeh, and were preparing for demolition. Approximately an hour earlier, Israeli media reported that three dead bodies, believed to be those of three missing Israeli teenagers who disappeared on June 12 from Gush Etzion settlement, had been found near Hebron. Israel says the two men who kidnapped the teens are Ammar Abu Eisha, 29, and Marwan al-Qawasmeh, 33, both from Hebron. The Israeli army said on Thursday that it was still searching for Abu Eisha and al-Qawasmeh. Abu Eisha's family has denied the allegations. 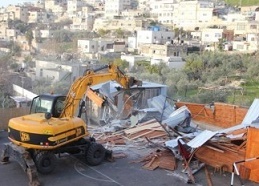 The Israeli occupation handed over on Sunday at dawn demolishing orders to three Palestinian houses in Shwaika, north of Tulkarem in the Occupied West Bank. The Israeli occupation claimed that the houses were not licensed "officially", and that they should be licensed from "Kedumim municipality, west of Nablus. The Palestinians denounced this step since the houses are located in area (B) which is licensed by the Municipality of Tulkarem and had been built since the nineties. The Israeli occupation handed also all houses adjacent to the borders, warning notifications of building any additional floors. In the same context, the Israeli occupation high court is to discuss on Monday the appeal presented by the family of Zyad Awad and some leftist Israeli institutions against the decision of the Israeli government to demolish his house..
Awad and his son were accused of being behind the killing of a settler and injuring four others near Tarqoumia two months ago. 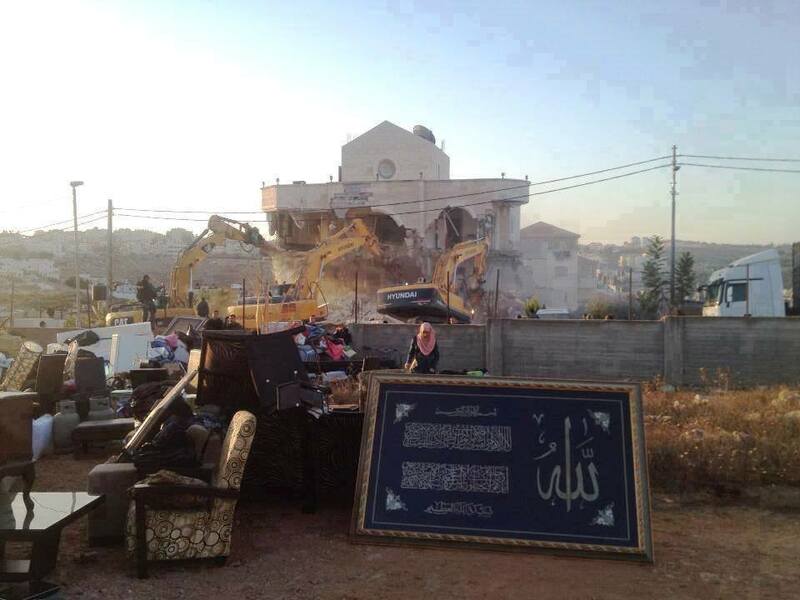 According to Israeli web site Walla , the court will consider all possible measures whether to demolish the house partially or completely or to cancel the demolishing decision. Sources confirmed that Zeyad's family filed papers proofing that the house rented and their families live at home and not only the prisoner and his family. 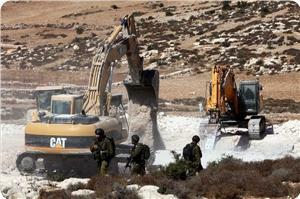 Israeli bulldozers on Sunday leveled Palestinian lands in the Salfit district in the central West Bank, locals said. 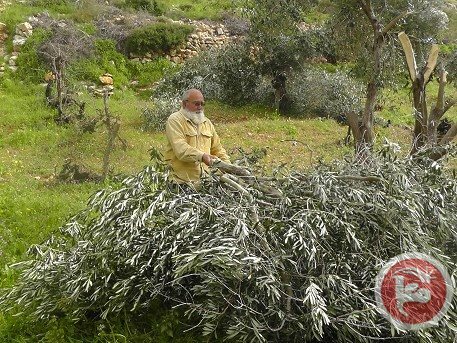 Witnesses said bulldozers uprooted dozens of olive trees and fruit trees in the Thahir Subih neighborhood of Kafr al-Dik. Local researcher Khalid Maali said that an Israeli court had approved confiscation of 3,000 dunams (750 acres) of private Palestinian land, but that the bulldozers had leveled an area of more than 10,000 dunams (2,500 acres). A spokesperson for Israel's civil administration said in an email to Ma'an that ''works are currently taking place at the site for the agricultural development of the region with the state's approval." "No tree uprootings were registered at the site. The lands in question are state lands and not private Palestinian lands," the spokesperson said, without providing further details. Israeli authorities regularly declare private Palestinian lands or historically communal lands used by Palestinians in the West Bank as Israeli state land for settlement construction and expansion. 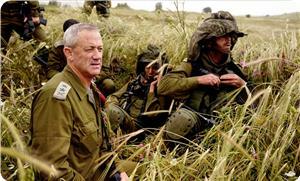 Chief of staff of the Israeli occupation army Benny Gantz said the army and its intelligence have yet to find any information leading to the kidnapped Israelis. Yedioth Ahronoth on Wednesday morning quoted Gantz as saying the Israeli army might reconsider the sanctions imposed currently against Palestinian civilians. He added that the army has approved a decision for the demolition of Ziyad Awad’s home in Idna village in retaliation for the alleged murder of an Israeli intelligence officer. The Israeli occupation army is also thinking over issuing bans and restrictions on the entry of Palestinians to the 1948 occupied Palestine during the holy month of Ramadan, Gantz further declared lamenting the difficulties lying ahead of the Israeli attempts to rally international support around the issue of the missing Israelis. He confirmed that the search for the missing teenagers are ongoing but with the passing of time fear grows over the lives of the hostages, who are most probably alive in Gantz’s view. Gantz said the area is large and there is enough room for camouflage and concealment, but the Israeli army works day and night to get to the kidnappers. Israeli forces on Thursday demolished the walls of a mosque under construction in Shufat refugee camp in East Jerusalem, a camp spokesman said. Israeli soldiers escorted a bulldozer from Jerusalem's municipality to the camp and destroyed the foundation of the mosque. Shufat is the only Palestinian refugee camp within the municipal boundaries of Jerusalem and is administered by the UN agency for Palestinian refugees. In December 2011, Israeli authorities instated at the entrance of the camp a checkpoint which limits the access of Shufat's 45,000 residents to the rest of Jerusalem. For the first time since 2009, Israeli occupation authorities issued a demolishing order for the house of Ziyad Awwad , the alleged suspect for the killing of Baruch Mizrachi, as a punishment. 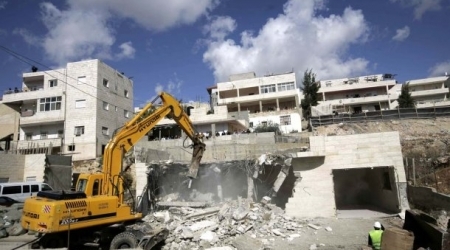 Israeli sources revealed that Israeli occupation government intends to increasingly ask the court to allow the punitive house demolitions which they believe have proven effectiveness in the past. According to B’Tselem, Israel demolished some 666 houses as punishment during the years of the second intifada, from 2001 until the practice was discontinued in February 2005. Since 2005, Israeli war ministry stopped demolishing practices saying it does not have a deterrent effect and, instead, it stirs up more hatred. 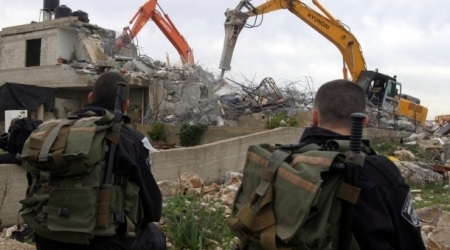 Israeli Magistrate Court in Acre issued a demolition order for a Palestinian house owned by Barakat Hayadra in Sakhnin city under the pretext of building without a permit. The family lawyer Omar Hayadra said, the court authorized the Planning and Housing Committee(Lev HaGalil) to carry out the order despite of the observations we have made. “We will study possibility of appealing the order,” he pointed out. Sakhnin city and the nearby towns have been suffering from high population density. It is hard for Palestinians there to obtain construction permits . “Israel Land Administration” used to prevent the development and expansion of the Palestinian community. Israeli soldiers invaded, on Tuesday, Barta’a Palestinian village, south of the northern West Bank city of Jenin, and handed military orders for the destruction of more than ten stores. Member of the Barta’a Village Council, Tawfiq Kabaha, stated that dozens of soldiers, and members of the Civil Administration Office, run by the military in the occupied territories, invaded the Industrial Area in the village, and handed the orders. Soldiers also conducted searches of various homes, and property, in the village, causing damage. The invasion is one of dozens of invasions, carried out in the village, in the last two months, and the army handed orders against more than 21 homes, and industrial structures. Also on Tuesday, soldiers invaded the Hasaka village, north of the southern West Bank city of Hebron, and drained water wells used by the residents for their homes, and lands. 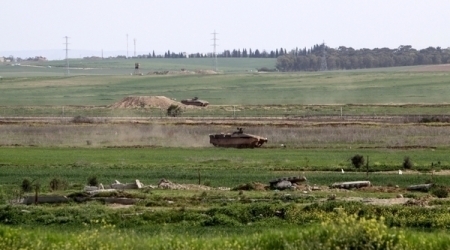 A number of Israeli bulldozers have penetrated, Monday at dawn, into Palestinian lands near Nahil Ouz east of al-Shija’ya neighborhood, eastern Gaza city. 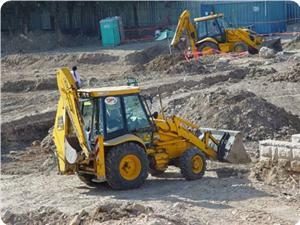 The bulldozers razed several Palestinian farmlands in the area, according to eyewitnesses. They added that the Israeli warplanes were flying at law levels during the operation. Despite the withdrawing of the Israeli settlers and military forces from Gaza in 2005, Israel maintains complete control over the Gaza Strip's airspace, territorial waters, and most land crossings. Israel tightened a blockade on the Gaza Strip in 2007 following Hamas' election victory. 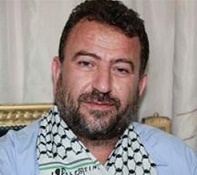 In the first direct accusation since the three Israeli settlers went missing a week ago, an Israeli security source, accused Hamas leader, Salah al-‘Arouri, of being the mastermind, and financier, of the believed kidnapping. Al-‘Arouri, from ‘Aroura town, north of the central West Bank city of Ramallah, currently resides in Turkey, and Israel alleges he is the moving force that encourages Hamas fighters in the West Bank, to form new cells and abduct Israelis, the Arabs48 news website has reported. The unnamed Israeli security source, quoted by Walla News, reportedly said al-‘Arouri is in charge of preparing and financing the cells, but added that Israel has no concrete proof that could implicate the Hamas leader, and directly connect him to the case of the missing Israelis. The source added that Israel is not facing an official army that follows direct orders, but a series of cells, operating in the occupied territories. He also alleged that dozens of envoys, sent by al-‘Arouri, visited the West Bank through Jordan, and that some of them have been kidnapped by Israel, while others managed to enter the West Bank and leave it without being detected. He said the chances that the Hamas leadership in Gaza, or Palestinian detainees released under the Shalit prisoner swap deal, are involved in the abduction are marginal, adding they allegedly “tried to carry out such attacks, but their chances of success are very low”. Israel believes al-’Arouri financed cells by transferring money through charities operating in the West Bank, and that the Hamas movement has four groups capable of planning, and abducting Israelis. He explained the groups are; the Hamas leadership in exile through al-’Arouri “who receives orders from the Hamas Political Bureau head Khaled Masha, the second is Hamas leadership in Gaza, the third of Hamas operatives who are constantly targeted by Israel, and Hamas detainees in Israeli prisons, who have very limited resources. Several Israeli military vehicles invaded, on Friday at dawn [June 20 2014] the ‘Aroura village, north of the central West Bank city of Ramallah, and demolished the home of Hamas political leader, member of its political Bureau, Saleh al-’Arouri. Local sources said a number of military vehicles and armored bulldozers, invaded the village, and handed the family a military order against their home. The soldiers invaded the property and ransacked it. Al-'Arouri currently resides in Turkey. The source said the military helicopters also participated in the invasion, while several Israeli paratroopers were observed landed there. Dozens of soldiers were deployed in the streets before breaking into and searching dozens of homes. The army also cut the village’s power supply, prior to the invasion. In related news, soldiers invaded the Dahiat al-Balou’ area, north of Ramallah, before breaking into and violently searching dozens of homes. 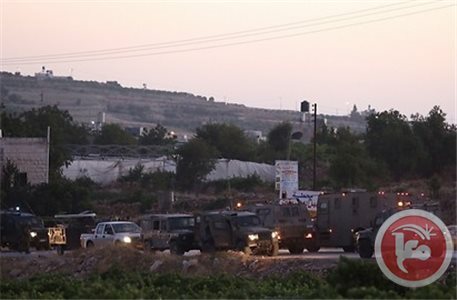 Israeli paratroopers were also seen landing in Deir Ammar village, West of Ramallah, and dozens of soldiers also invaded the villages of Sinjil and Abwein nearby villages. In addition, a number of fanatic Israeli settlers attacked and destroyed Palestinian cars in Dahiat Jabal at-Tawil, in al-Biereh town, near Ramallah. 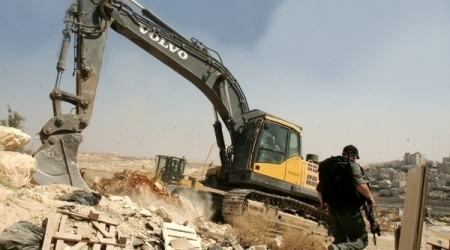 The Israeli Occupation Forces (IOF) demolished afternoon Wednesday Palestinians homes in Yatta town and agricultural facilities belonging to Palestinian farmers in Fawwar refugee camp in al-Khalil. Activist Ratib Jabour told the PIC reporter that Israeli bulldozers demolished this morning 4 homes and a mobile house in Yatta town in al-Khalil under the pretext of being built without permit. On the other hand, eyewitnesses confirmed to the PIC reporter that large Israeli forces accompanied with military bulldozers have destroyed Palestinian agricultural facilities and water pools used for watering crops in Fawwar camp. The National Bureau for the Defense of Land and Resistance to Settlements warned in a weekly report that the settlement activity in the occupied West Bank has escalated during the past week. The report revealed an Israeli scheme to construct 12 thousand new settlement units in "Modi'in - Maccabim - Reut" settlement bloc within the next four years. It added that Israel Lands Administration (ILA) has recently marketed lands to establish 1735 settlement units during this year. Some land plots in north Jerusalem are also being marketed to construct 182 units in the settlement of Pisgat Ze’ev. Meanwhile, the Israeli Planning and Building Committee announced its final approval for the construction of the Kedem center in Wadi Hilwa to the south of al-Aqsa Mosque, in order to boost Israel's tourism in the neighborhood. The building will be supervised by the Elad association. The National Bureau’s report further stated that Netanyahu government has approved construction permits for 387 settlement units in Ramat Shlomo, to the south of occupied Jerusalem. It added that last week the Israeli government also approved the establishment of a new settlement neighborhood in Ariel and Berkane settlements in Salfit, northern the West Bank, in addition to other settlement projects in "Kochav Jacob" and "Pisgat Ze'ev" near Jerusalem. The report reviewed the Israeli persistent plans to Judaize Jerusalem, pointing out that the occupation municipality, the Israeli Ministry of Tourism and the Jerusalem Development Authority have organized the Jewish Festival of Lights for the sixth successive year in the city, during which hundreds of settlers stormed al-Aqsa Mosque. Meanwhile, the Israeli occupation authorities bulldozed a Palestinian land in Wadi Joz neighborhood near the historic walls of Jerusalem for unknown reasons. In al-Khalil province, Israeli soldiers expanded the vicinity of the military watchtower placed at the entrance of Beit Ummar town.